Dodgers Blue Heaven: Welcome to the Blue, Ryan Moseley! 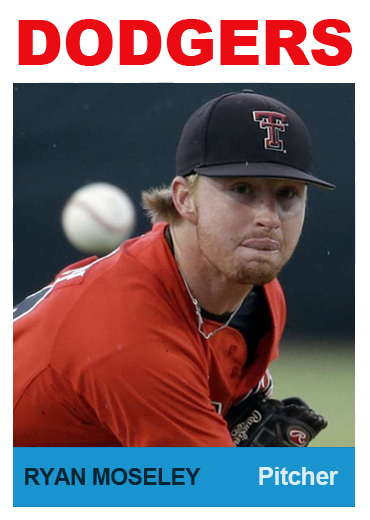 "Moseley moved into the Texas Tech rotation late in his freshman year and didn't allow an earned run in four NCAA playoff starts as the Red Raiders advanced to the College World Series. His solid sophomore season and spectacular fall had scouts thinking he'd emerge as a first-round pick this June, but he lasted just three starts this spring before getting pulled from the rotation. There's no doubt that Moseley has enough pitches to start. His primary weapon is a 91-95 mph fastball with power sink. Both of his low-80s secondary pitches can be at least above-average offerings at their best, with his lively change-up more consistent than his slider. The problem is that Moseley's control and command aren't sharp, which gets him in trouble because he's more hittable than he should be and runs up his pitch counts too quickly. His stuff is more electric in shorter stints, so he could become a high-leverage reliever in the big leagues, but pro clubs aren't ready to give up on him as a starter." Big thanks to the O's for the opportunity and the meeting of some lifelong friends. Excited to get things going with the Dodgers! BTW, this trade is a big win for the Dodgers. They essentially traded Carlos Ruiz (who they got from Philadelphia for AJ Ellis and a couple over-aged prospects) and his $4.5 million option to Seattle for Nuño over the winter. Then, they shipped Nuño to the Orioles for Moseley. In other words, they traded AJ Ellis for an 2016 8th round pick. That's not too shabby. In celebration of Moseley's becoming a Dodger I made the above fantasy Baseball card of him. I used the 1964 Topps Baseball card design.